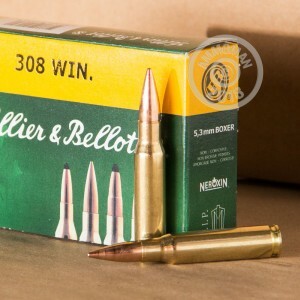 This new production ammunition from Sellier & Bellot is an excellent companion for your M-14, FAL, AR-10, or other .308 Winchester/7.62 NATO rifle at the range. 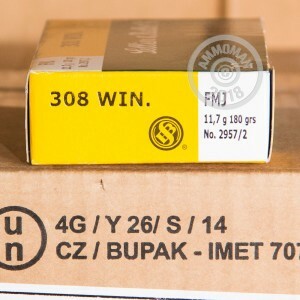 These cartridges deliver solid long-range accuracy at a relatively moderate price. Each cartridge in this box of 20 propels a heavy 180 grain full metal jacket bullet to a muzzle velocity of 2,411 feet per second. The use of a heavy bullet provides additional stability in flight, resulting in more consistent external ballistics at long range. 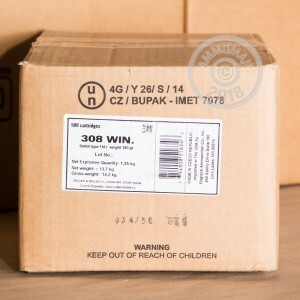 S&B ammo is loaded in the Czech Republic using non-corrosive Boxer primers and reloadable brass cases.